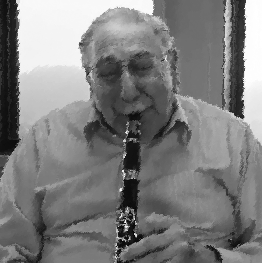 My buddy Shoehorn sent my a link to a video by his teacher Dr. Olando Tognozzi on how to get a great sound on woodwinds by the use of correct throat position. Tognozzi plays jazz saxophone, flute, sings opera, conducts orchestras and choirs. His credits include New Orleans Symphony, Xavier University in N.O., Tampa Symphony, St.Louis Symphony, Agnes DeMille Dance Company tours, the U.S. Marine Band, and he was a professor at Shasta College in California for several decades. He currently resides in the Sacramento area. He is a legend in N.O., where his students included the late clarinetist Alvin Batiste and alto man Earl Turbinton. Tog, the nickname his students use, will be 86 next month.